The aim of Countesthorpe U3A is to enhance the lives of older persons in the locality who are not in full-time gainful employment. Our range of self help groups utilises members' own skills and knowledge to provide learning, creative, leisure and social activities in a friendly environment. PETER BRADBURY (Chairperson) was born in Leicester and moved to Countesthorpe in 1968 with his wife Winifred. In 1978 the family moved to Sapcote, though an affinity with Countesthorpe has always remained. After teaching in Wigston schools for 36 years, Peter fully retired from his management and consultancy posts in 2007. He enjoys spending as much time as possible with family and especially his nine grandchildren. Peter joined the U3A in 2010 and participates in handbells, art, history, bird-watching, travel and groups. He enjoys DIY, reading, classical music and history, as well as voluntary work within Sapcote. DAVID FAGG (Treasurer) moved to Countesthorpe, from Eastbourne, in August 2017 with his wife Gloria and they joined Countesthorpe U3A a month later; enjoying SWANS, Flower Arranging, Classical Music, Travel and History and Crafts and other groups to follow. They moved to Countesthorpe on the advice of friends and family in the area. David has a knowledge of the Midlands from attending the City of Coventry Boarding School in Cleobury Mortimer, and working for National Westminster in the field based in Kegworth. Although they lived in Eastbourne for 19 years, they have lived and worked in various places in Kent, Hong Kong (15 years) and the Middle East (4 years) and Central Europe. David has a background in Banking Operations and project management, and since returning to the UK (having re-engineered himself out of a job four times) has held various jobs in Insurance, Retail Fashion Outlets, Personal Shopper with Tesco, Bus Driver, and Father Christmas for M&S and Matalan. They have three girls and one son. CHRIS CLARICOATES (Secretary) was born on the Isle of Wight and lived there for 14 years before her move to Countesthorpe. Married to Tony, they have three children who all attended local schools. Chris taught at Leysland High school for 25 years before her retirement and she now enjoys volunteering in the local library and participating in the U3A History, Theatre, Fit for Life and Folk Dancing groups. DAVID WILD (Membership Secretary) is married to Ursula. He is not native to this area but was soon hooked on village life after buying a house in Countesthorpe in 1978. He retired in February 2008 from a database-design career in insurance and quickly found that the U3A offered a very warm welcome. He enjoys a rewarding time with History Group trips, Sci/Tech meetings, Classical Music Group, walks and the warm buzz of the committee meetings. He also runs the Guitar group. JUNE HAWKINS (Vice Chair, Publicity and Information) lived in Countesthorpe for 39 years before her recent move to Blaby, and has been a U3A member since 2004. After retirement from her senior management post in 2008, and also running her own small business she now enjoys U3A Travel, Creative Writing, Literature and Discussion, groups and is also Group Leader for Theatre and History. She maintains the website and produces the Newsletter, What's On, group activity information and the monthly slide presentation. She edited and designed the five 'Creative Writing Miscellany' booklets. She also enjoys volunteering in the local library and foodbank. HELEN BULL (Speaker Secretary) Helen has lived in Blaby for 50 years. On retirement from her post at Brockington College she sought a social/interest group to fill her anticipated spare time and has found companionship through involvement in the U3A, enjoying many aspects, including the monthly meetings and the Theatre, History, Literature, Walking and Allotment groups. Outside the U3A, Helen's interests include frequent visits to her three children and six grandchildren, and gardening, yoga and knitting. JENNY MILLS (Groups Co-ordinator) has lived in Blaby and Countesthorpe all her life. Since retiring from her senior position as a Lecturer at South Wigston College she has been closely involved with the U3A since its inception, and was Travel Group leader for more than 10 years. She is now looking forward to supporting Group Leaders and establishing new groups. She also enjoys Hand-bell ringing, Bridge and attends History, Travel and Theatre group activities. BARRY HILLYARD (Technical Officer and Deputy Publicity and Information) has been a member since 2006, a year before his retirement from teaching mathematics and IT. Married to Pat, he has lived in Countesthorpe for 40 years, and has been involved with the Methodist Church and the Scouts. His hobbies include computers and photography. He runs the U3A Carpet Bowls, Computer, Nordic Walking and Beginners' Photography groups, and also participates in the Photography, History, Walking and Travel groups. BERYL LISHMAN (Deputy Speaker Secretary) has lived in Countesthorpe for over 25 years. She has two, now grown-up, girls who attended the local schools and college. She is a retired primary school teacher who joined the U3A a couple of years ago when working part-time. She attends the Literature group, and the Tuesday meetings when possible and has been on several theatre trips. Apart from the U3A, she sings in the South Wigston Sing4fun choir, is a member of the Leicester Footpaths Association, and volunteers in the local library, as well as spending time caring for her grandchildren. 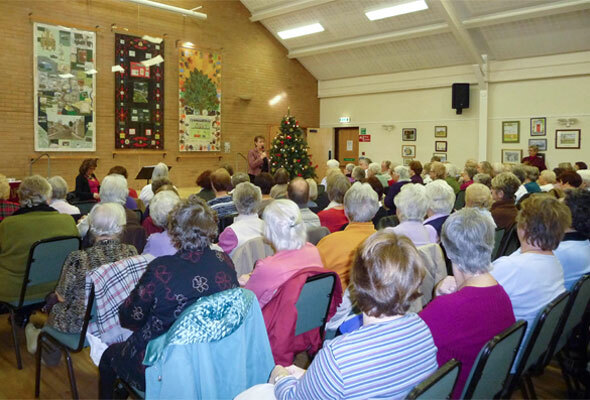 She welcomes the opportunity for more U3A involvement by serving on the committee. PAULA WOLLASTON (Deputy Groups Co-ordinator) and husband, Len, have lived in Countesthorpe for 25 years. They have family in Norfolk and Whetstone, with grand-daughters at Leicester University and a local school, plus a grandson who is a rock guitarist. Since retiring from her post with the Home Office 15 years ago Paula has enjoyed volunteering with De Montfort Hall Publicity Department and the A&E Department of the LRI, and is currently secretary and helper at the Senior Citizens' Luncheon Club in the village. Her interests include travel, historical houses and gardens, theatre, cookery and dining out. JOAN BERRY (Committee Member) was brought up in South Wales, originally moving to Countesthorpe from Surrey in 1980, returning in 1989 after a short time in Rutland. Both her children attended the village schools, and her son and family currently live in the village. Joan joined the U3A after early retirement as Volunteer Coordinator for Leicestershire County Council. Previously she was Volunteer Manager at the Volunteer Centres in Braunstone Town and Market Harborough. She attends monthly meetings and is presently exploring U3A groups. She enjoys reading, film and drama and loves to cook. "Enhancing the lives of local people"
Through learning, creative, leisure and social activities. U3A stands for the University of the Third Age, which is a self-help organisation for people no longer in full-time employment, and which consists of local U3As all over the UK. They are charities in their own right and are run entirely by volunteers. They are also learning co-operatives which draw upon the knowledge, experience and skills of their own members to organise and provide interest groups in accordance with the wishes of the membership. The teachers learn and the learners teach. U3As in general offer the chance to study a wide range of subjects in such fields as art, languages, music, history, life sciences, philosophy, computing, crafts, photography and walking - check out our own list of activity groups, below. The U3A approach to learning is - learning for pleasure. There is no accreditation or validation and there are no assessments or qualifications to be gained. "What a friendly lot they are"